The events of November clearly demonstrate that Russia is really trying to make the most of its geographic location, historical and political status. President Vladimir Putin appears in different parts of the world: he was only in Paris, and now he moved to Singapore to take part in the Russia-ASEAN summit (the countries of Southeast Asia). On November 14, the head of state held several important bilateral meetings. During this day, the Russian leader several times found himself in situations that, to put it mildly, are uncharacteristic. For example, Putin was not allowed to pass by the scope of the metal detector, sending the Russian president to be checked. Usually, even the ministers do not have to prove that they don’t carry anything forbidden - a special corridor is provided for their passage - and here the security service followed, apparently, some special instructions. It remains to hope that they concerned all the guests of the summit without exception. By the way, Vladimir Putin in the frame “rang”, but the contents of his pockets remained a mystery - no secret phone or something like the world was presented. Apparently, the Singapore intelligence services were convinced of the non-danger of the Russian president by some other means. 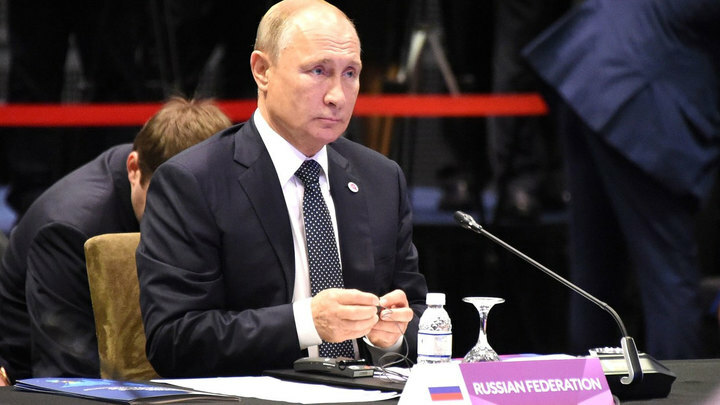 Putin devoted his speech at the event, which was held in the so jealously guarded Suntec trade fair center, to the development of humanitarian ties between Russia and the ASEAN countries. In some of them, the problem of the spread of deadly diseases, which have already been overcome in more developed countries, still remains. The President of Russia even took the initiative to hold joint exercises, during which actions to respond to the spread of the most dangerous infections would be worked out. The head of state also noted that the participation of the Russian delegation in future investment forums would be extremely useful. The inconsistencies continued in the Shangri-La Hotel, in which President Putin stayed. Here, the delegation headed by him had several bilateral meetings, including with South Korean and Japanese colleagues. In spite of the fact that the Russian leader formally accepted the guests, he was not late, as it is, what to hide, is often the case, but his foreign colleagues. Time was waiting for South Korean President Vladimir Putin under camera flashes, discussing something with Foreign Minister Sergei Lavrov. It took at least five minutes before Moon Jae Ying appeared in the meeting room. As the President of Russia noted at journalists, relations with South Korea are very extensive, therefore there are many topics for conversation. It sounded as if it was a light rebuke. They say time is so short, the schedule is saturated, and you are also late. The leaders of the two countries also spoke about economic ties and the situation on the Korean Peninsula. Mun Zhe Ying noted that the Olympic Games in Pkhenchkhan were a very important step towards reconciliation of the DPRK and South Korea. On which, however, Russia was left without a national team as such, but of course, no one spoke out loud about that. Already without journalists, the presidents talked for about an hour. Could and more, but the tight schedule is not allowed. The Prime Minister of Japan Shinzo Abe also made himself wait. In his absence, the Russian delegation, which had begun to be nervous, was reassured by Japanese Ambassador to Russia Tooehisa Kodzuki. He urged everyone to sit in three rows of chairs. However, Lavrov and company were waiting for Vladimir Putin. Only when about ten minutes had passed, and the perseverance of the Japanese diplomat began to tire, everyone sat down, except for Igor Sechin. He seemed to feel that the Russian president was about to enter. And so it happened. But the head of the Japanese government was not. Putin again began to while away the time, communicating with Lavrov. Waiting was delayed, therefore the head of state had a chance to spread a few words with the Minister of Economic Development Maxim Oreshkin, Chairman of the Board of Gazprom Alexey Miller and the head of Russian Railways Oleg Belozerov. They even discussed who was invited to dinner, and who was not, and on which transport to go there. Finally, Shinzo Abe appeared. At the camera, he outlined a plan for the upcoming talks, not hiding the fact that they would also discuss the notorious peace treaty, which Vladimir Putin publicly offered in September to conclude already in 2018, without introducing any additional conditions. Obviously, since this has to be discussed, this option does not suit Japan. Also at the meeting an important related issue was discussed - bilateral projects in the South Kuriles. An agreement on joint economic management on the islands has existed since 2016, but in practice nothing has yet begun. Everything rests again in the legal subtleties. Japan does not want to conduct projects in the South Kuriles under Russian laws, and Moscow does not intend to recognize foreign legal jurisdiction in its territory. According to the press secretary of Russian President Dmitry Peskov, the parties intend to speed up the process. Countries will build on the 1956 Soviet-Japanese declaration on ending the state of war. It was signed on October 19 in Moscow. At the same time, the diplomatic and consular relations of the two states were restored. In one of the articles of the document, the Soviet government agreed to transfer to Japan the islands of Shikotan and a number of small uninhabited islands of the Lesser Kuril Ridge (Habomai) with the condition that their actual transfer under the control of Japan would be made only after the conclusion of a peace treaty. But after the Japanese concluded a security treaty with the Americans in 1960, the Soviet Union annulled its obligations to transfer the islands. If Russia and Japan can agree now, it will mean that one of the parties has made concessions. The territorial dispute has been going on for more than half a century, and it is not surprising that a solution that suits both parties has not been found. In the light of rather complicated relations with the West, the conclusion of a peace treaty with Japan could become a sign showing that, despite the sanctions and the pressure of a different kind on Russia, it is capable of constructive dialogue, if it is considered and respected.